One woman is making it her mission to help those living in poverty have a roof over their heads—something many would take for granted. Bolivia is one of the poorest countries of Latin America—with health, development, education, malnutrition, and life expectancy at low levels. Around 40 percent of the population are living in extreme poverty, according to Unicef. When it comes to housing, as you can imagine, the Bolivians fare no better, and families are often forced to live in one-room shacks with dirt floors. According to Habitat for Humanity, 58 percent of Bolivians live in slums that do not meet the minimum living conditions and lack basic services and sanitation. Ingrid Vaca Diez, from Santa Cruz, Bolivia, is a well educated professional lawyer but became a self-taught architect in order to help tackle the country’s housing crisis. 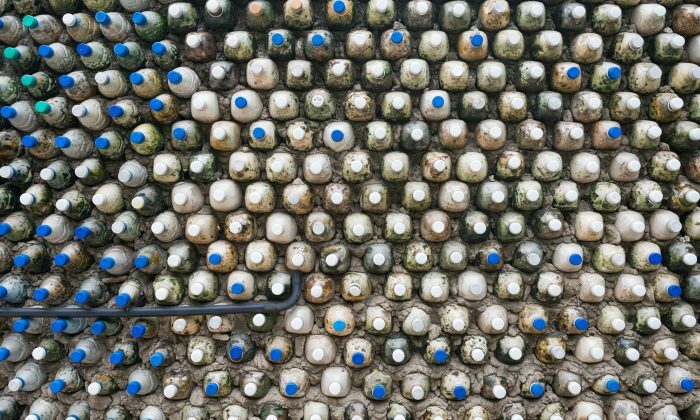 The idea formed after her husband asked her why she had collected so many plastic bottles on their porch, and commented that she had enough to build a house. This was reinforced after she received a letter from a young schoolgirl at a local school. Diez had asked the children to write down what they wanted for Christmas; one girl asked for a bigger room for her family, as the one they all lived in, which was made out of cardboard and rubber, continually leaked. So Diez set about designing and building houses made from plastic and glass bottles for the needy. It is very time consuming, with around 36,000 plastic bottles required to build a 1,830-square-foot house. After collecting plastic bottles and filling them with dirt or sand, these filled bottles are used like bricks and become the materials used for walls. Such a labor-intensive project would be impossible for one person to complete alone—so Diez recruited other locals and supervised the house’s construction in all the stages. As Bolivia is such a poor country, Bolivians receive a lot of aid; this has made many of them lazy and apathetic. Diez wanted to help change this by involving them in the building process. “I would like to change the mindset of the people we’re building for,” Diez told Al Jazeera. She wanted them to feel they could achieve something, and value the work they did. “When the people I’m building the houses for make the effort, it’s worth it,” Diez added. With construction materials being expensive, Ingrid Vaca Diez relies on donations to help her building projects. Sand, cement, and wire paint all cost money, with the roof being the most expensive part, usually over $2,000. It takes her one month to build a house—sometimes, an old corrugated iron board is donated and used as the roof, and with a bit of paint, it can look new again. “We fulfill their dreams. For me, this is the greatest reward,” Diez said. Despite having no building experience and no funds, Diez’s determination and love for her country people inspired her to take action and help change their lives. Helping others in need is something we can all aspire to. We might not be building houses for others like Diez, but even small acts can make a difference. Vancouver’s scorching housing market badly needs more supply.